Big Bear has long been a vacation destination for folks living in Southern California to beat the Summer heat or hit the slopes for a day of skiing or snowboarding. Now the Big Bear Hostel welcomes you to come stay in our mountain paradise. We are fun and affordable! Our two large cabins were fully renovated into a commercial lodge in 2008. We have private rooms for 1-8 people and dorm beds for budget travelers. Our central location is just 5 minutes drive from the ski slopes or you can walk to restaurants, entertainment, nightlife, lakefront parks within 2 blocks. Or you can just sit on the redwood deck and look out over the marina, lake and mountains. Our BBQ is always ready for your afternoon cooking feast. Year round outdoor activities include skiing, snowboarding, road cycling, rock climbing, mountain biking, wakeboarding, kayaking, canoeing, fishing, hiking, and more! Over 25,000 people live here full time and get to experience year round clean air, sunny skies and relaxed pace of life. Our town is tourism supported and we love visitors from all over the world. 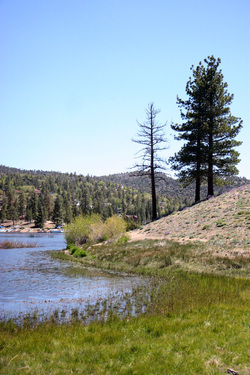 For travelers going between Southern California and Las Vegas, Big Bear Lake is a great stop as you travel through the desert. Summer temperatures are almost always comfortable even when the deserts are scorching Hot! Big Bear Hostel is just over an hour from Joshua Tree National park. It makes a great day trip if you are staying with us multiple nights.